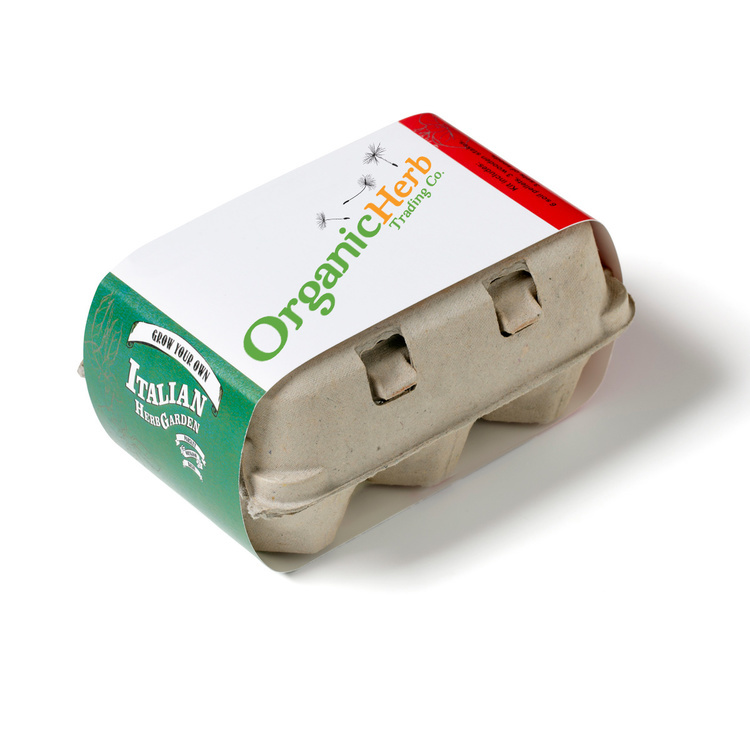 Our fertile fiber pot is 100% organic sustainable and biodegradable. Made from spruce wood and manufactured without glue or binders, this item is ready to be placed in outside soil. Because water air and roots will penetrate the walls of the fertile pot, there's no need for drainage holes. The natural root structure that develops will help in plant growth. This fun favor includes one soil pod and a seed pack of your choice. It germinates in 2-3 weeks, results may vary. OMRI listed and USDA Bio preferred. Select from a variety of seed types or receive a random assortment if one not specified. Our Grow Guy looks relaxed because growing the grass is so simple and quick! His head is pre-loaded with a bundle of seeds - just add water! 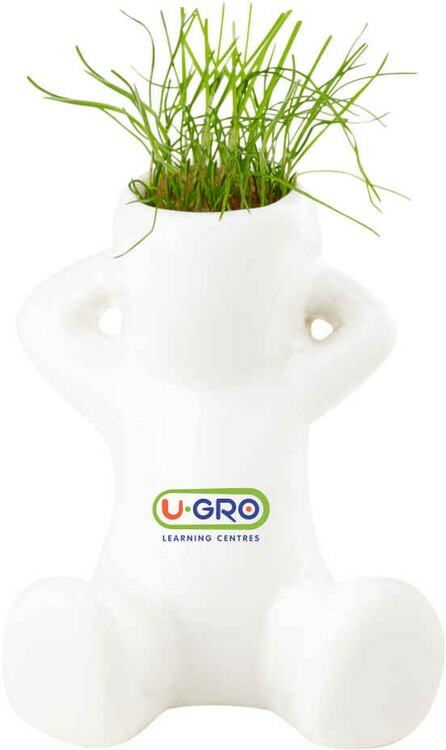 This fun desk accessory is great at home or the office for eco and earth-friendly corporate programs, environmentally thoughtful advertisers, schools, nurseries, landscapers, gardens, museums and more! Use slogans that include the words: Grow, Care, Develop, Nurture, Bloom, Produce, Sprout, Cultivate and Plant! 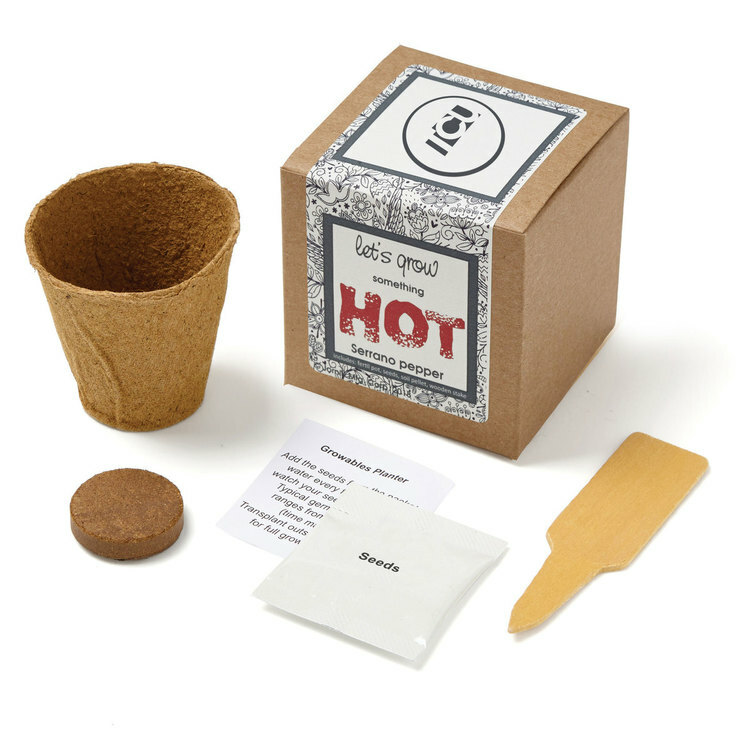 Grow Guy comes individually boxed in a clear box with growing instruction card. 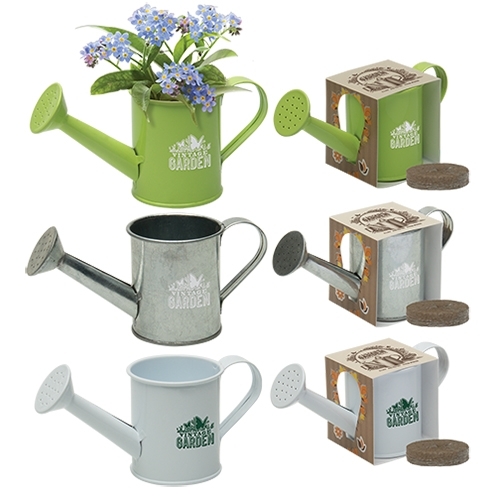 Our charming tall metal watering can come complete with soul and your choice of sunflower, forget-me-not or clover seeds- please specify seed type when ordering! Simply remove the seeds from the packet, plant under a light layer of good soil, water daily and maintain moisture until seedlings begin to sprout; typical germination time ranges from 1-3 weeks (instructions included). A random seed assortment will be used, if one type isn't specified. 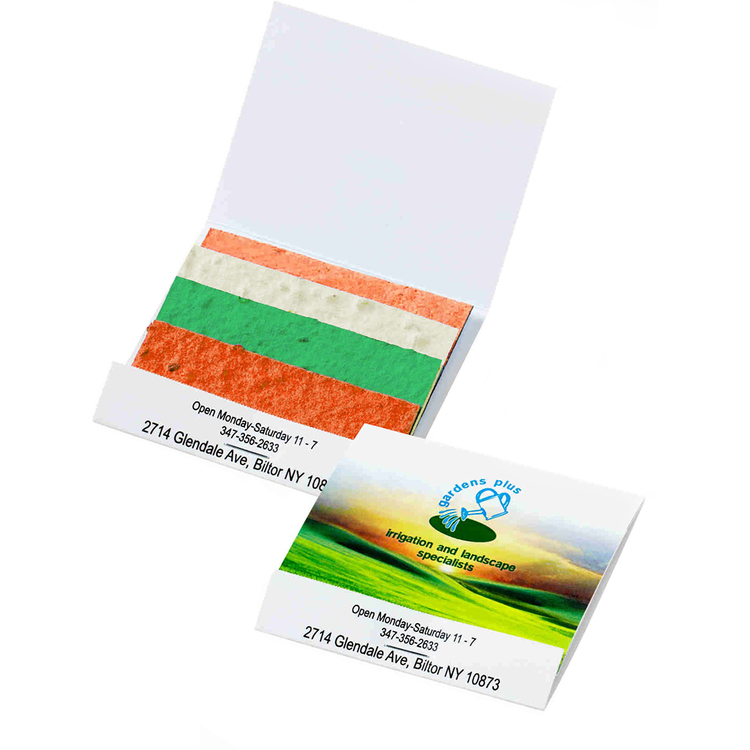 Each colorful layer of handmade eco-friendly paper in our packets is imbedded with seeds! Simply remove the paper from the packet, plant under a light layer of good soil, water daily and maintain moisture until seedlings begin to sprout; typical germination time ranges from 1-3 weeks. Give the gift of fresh basil! Our fertile fiber pot is 100% organic, sustainable and biodegradable (made from spruce wood, manufactured without glue or binders) and ready to place outside in soil. Because water, air and roots will penetrate the walls of the fertile pot, there is no need for drainage holes - the natural root structure that develops helps in plant growth. Includes one soil pod and a basil seed packet. OMRI listed and USDA Bio preferred. Germinates in 2-3 weeks (results may vary). Simply place the soil pod at the bottom of the pot, add the basil seeds from the packet, water every few days. Typical germination time ranges from 2-3 weeks (time may vary). Once established, transplant outside in fertile soil. Each fertile pot is packaged in a 3"sq. recycled Kraft gift box and includes one soil pod, one seed packet, one wooden stake and instructions. Item Size: Box - 3"sq, Fertile Pot - 2-1/4"h x 2-1/2" top dia. Some like it hot – give the gift of our jalapeño peppers! Our fertile fiber pot is 100% organic, sustainable and biodegradable (made from spruce wood, manufactured without glue or binders) and ready to place outside in soil. Because water, air and roots will penetrate the walls of the fertile pot, there is no need for drainage holes - the natural root structure that develops helps in plant growth. Includes one soil pod and a jalapeño pepper seed packet. OMRI listed and USDA Bio preferred. Germinates in 2-3 weeks (results may vary). Simply place the soil pod at the bottom of the pot, add the pepper seeds from the packet, water every few days. Typical germination time ranges from 2-3 weeks (time may vary). Once established, transplant outside in fertile soil. Each fertile pot is packaged in a 3"sq. 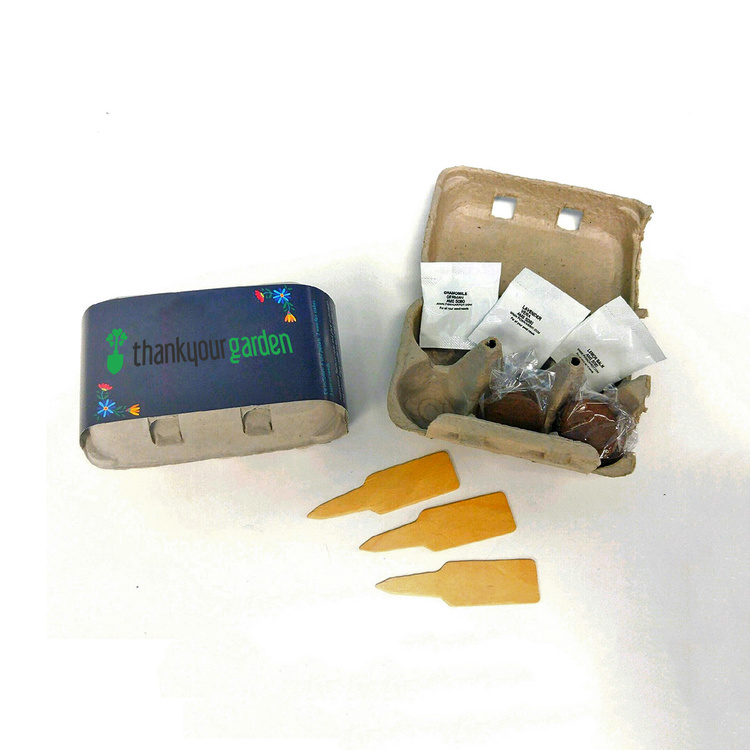 recycled Kraft gift box and includes one soil pod, one seed packet, one wooden stake and instructions. Item Size: Box - 3"sq, Fertile Pot - 2-1/4"h x 2-1/2" top dia. Filled with nuts, seeds, wasabi peas, and rice crackers these tubes are printed with a laminated 4-color process decal wrapped around the top. 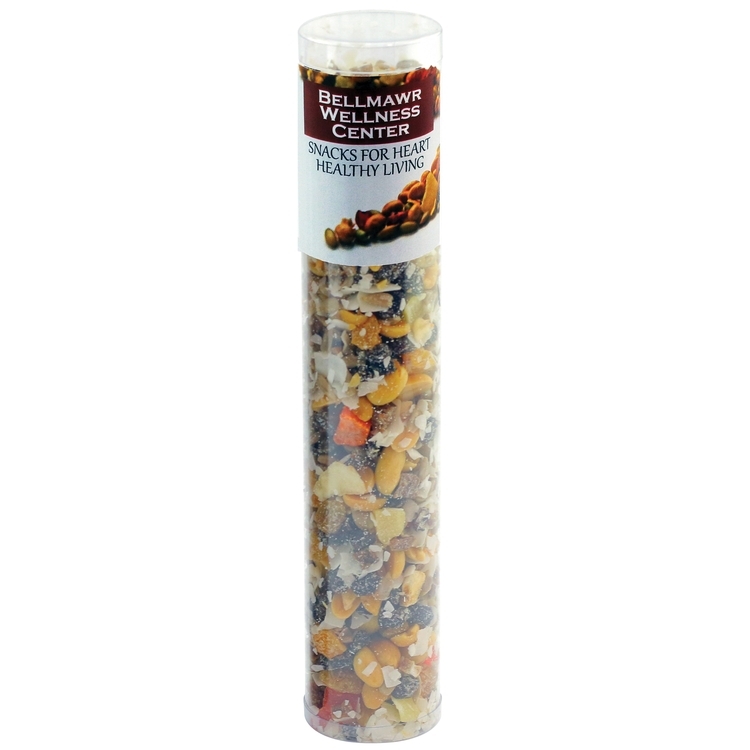 This tube can be filled with a variety of other snack mix treats. Healthy never looked so good! Our snack blends are bursting with flavor and nutrients and they're packaged in a convenient take-along tubes. Filled with nuts, seeds, and raisins these tubes are printed with a laminated 4-color process decal wrapped around the top. This tube can be filled with a variety of other snack mix treats. Healthy never looked so good! Our snack blends are bursting with flavor and nutrients and they're packaged in convenient take-along tubes. 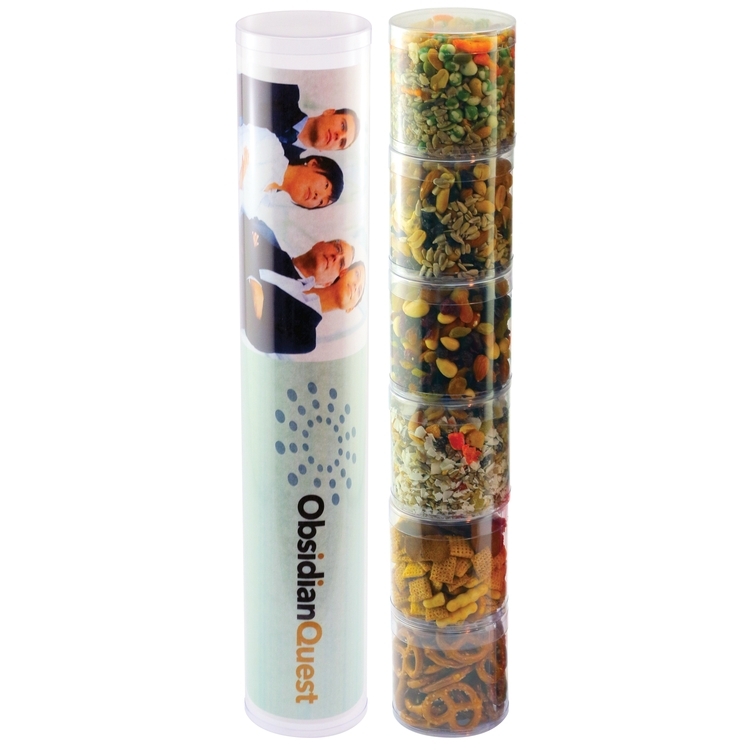 These three tubes are filled with healthy snacks including a survival, orients, and energy mix. The snack mix can contain nuts, tropical dried fruit, seeds, wasabi peas, rice crackers, raisins, chex mix, and pretzels. 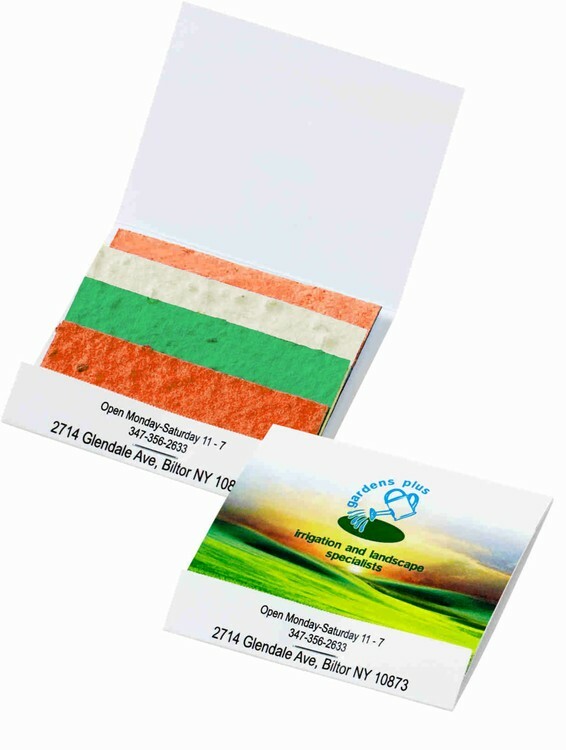 The 4 color process insert provides a nice way to show your appreciation. This tube can be filled with a variety of other chocolate treats. Great corporate food gift for the holidays or Christmas. 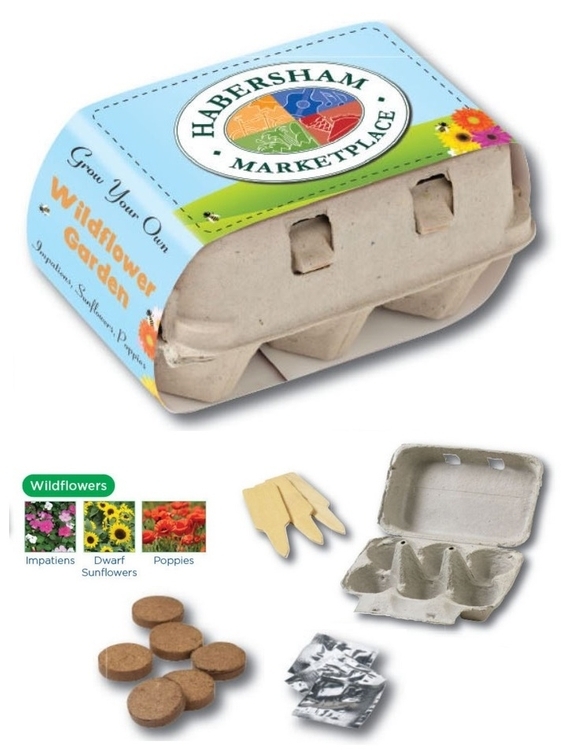 Choose from four new grow-your-own garden kits, in our 6-count recycled egg carton. Each kit includes three packages of seeds, starter soil and three blank wooden plant ID stakes that you can write on. 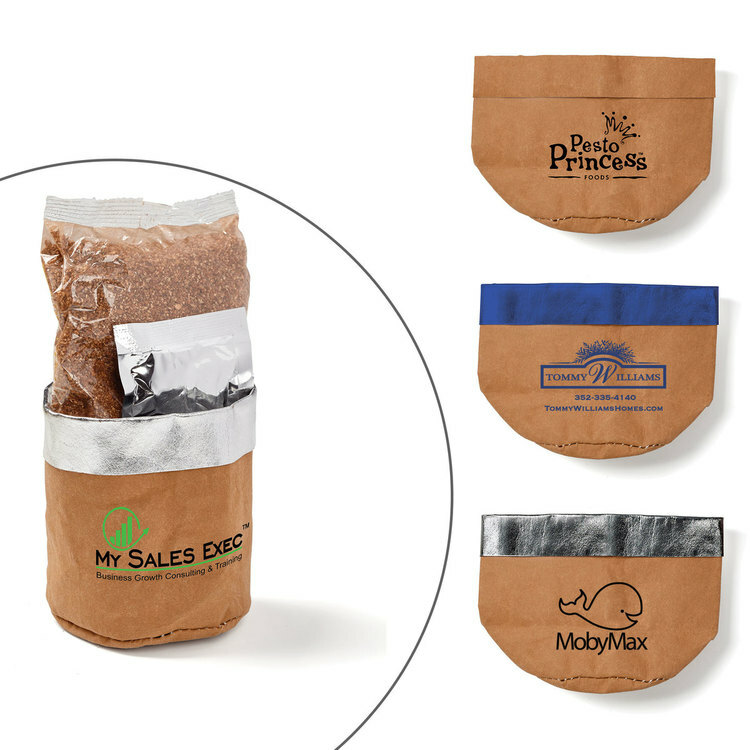 Use a stock design belly band or create your own-included in price. Herbs include: carpet of snow, peppermint stick zinnia, cinnamon basil. Give the gift of fresh parsley! Our fertile fiber pot is 100% organic, sustainable and biodegradable (made from spruce wood, manufactured without glue or binders) and ready to place outside in soil. Because water, air and roots will penetrate the walls of the fertile pot, there is no need for drainage holes - the natural root structure that develops helps in plant growth. Includes one soil pod and a parsley seed packet. OMRI listed and USDA Bio preferred. Germinates in 2-3 weeks (results may vary). Simply place the soil pod at the bottom of the pot, add the parsley seeds from the packet, water every few days. Typical germination time ranges from 2-3 weeks (time may vary). Once established, transplant outside in fertile soil. Each fertile pot is packaged in a 3"sq. recycled Kraft gift box and includes one soil pod, one seed packet, one wooden stake and instructions. 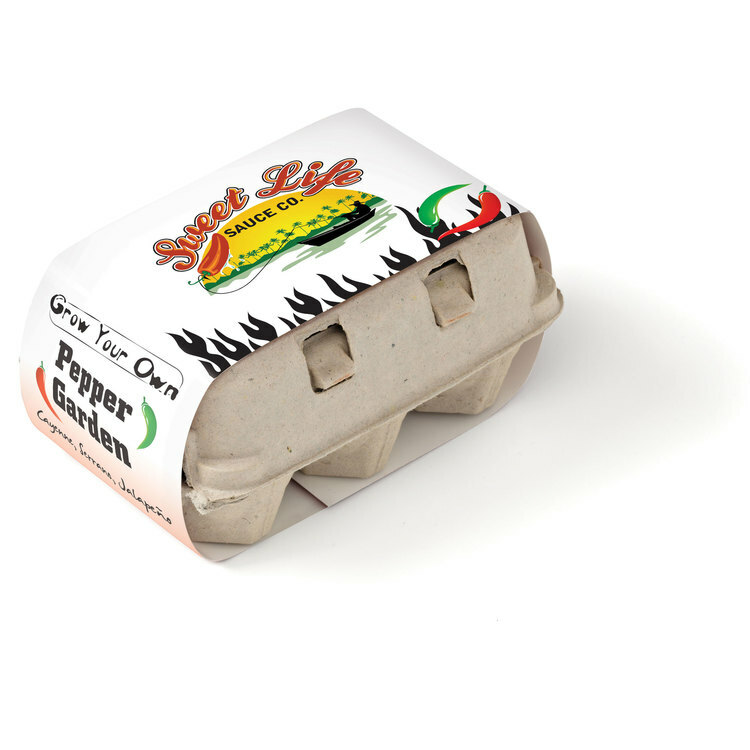 Some like it mild – give the gift of our serrano peppers! Our fertile fiber pot is 100% organic, sustainable and biodegradable (made from spruce wood, manufactured without glue or binders) and ready to place outside in soil. Because water, air and roots will penetrate the walls of the fertile pot, there is no need for drainage holes - the natural root structure that develops helps in plant growth. Includes one soil pod and a serrano pepper seed packet. OMRI listed and USDA Bio preferred. Germinates in 2-3 weeks (results may vary). Simply place the soil pod at the bottom of the pot, add the pepper seeds from the packet, water every few days. Typical germination time ranges from 2-3 weeks (time may vary). Once established, transplant outside in fertile soil. Each fertile pot is packaged in a 3"sq. recycled Kraft gift box and includes one soil pod, one seed packet, one wooden stake and instructions. 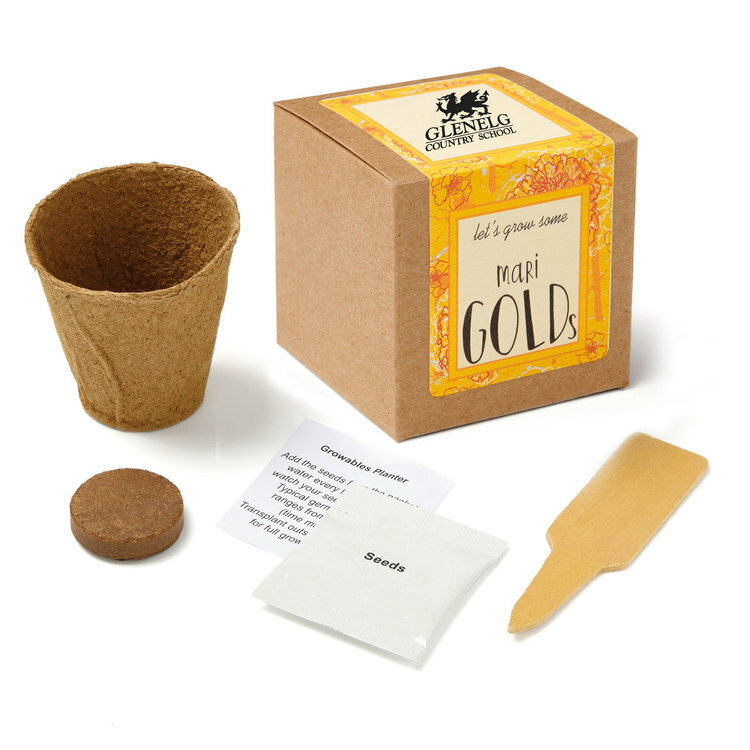 Give the gift of the “herb of the sun” with marigolds! Our fertile fiber pot is 100% organic, sustainable and biodegradable (made from spruce wood, manufactured without glue or binders) and ready to place outside in soil. Because water, air and roots will penetrate the walls of the fertile pot, there is no need for drainage holes - the natural root structure that develops helps in plant growth. Includes one soil pod and a marigold seed packet. OMRI listed and USDA Bio preferred. Germinates in 2-3 weeks (results may vary). Simply place the soil pod at the bottom of the pot, add the marigold seeds from the packet, water every few days. Typical germination time ranges from 2-3 weeks (time may vary). Once established, transplant outside in fertile soil. Each fertile pot is packaged in a 3"sq. recycled Kraft gift box and includes one soil pod, one seed packet, one wooden stake and instructions. 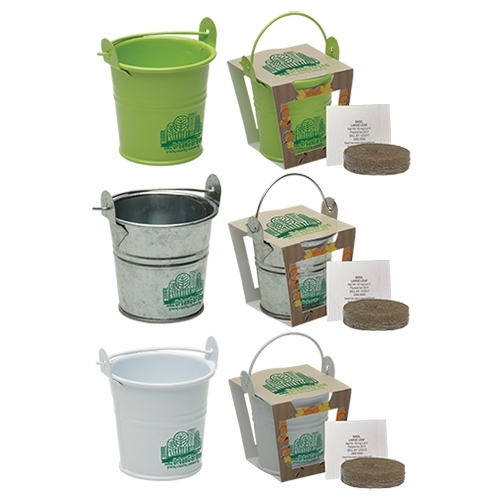 Waterproof kraft style grow bag with vermiculite soil and your choce of sunflower, forget-me-nots or clover seeds. Typical germination time ranges from 2-3 weeks (time may vary). 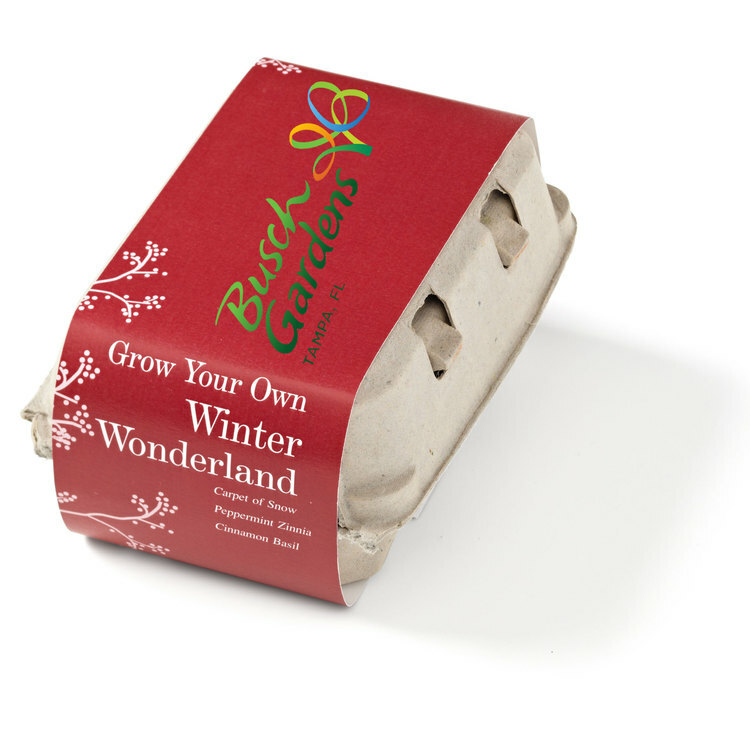 Choose from four new grow-your-own garden kits, in our 6-count recycled egg carton. 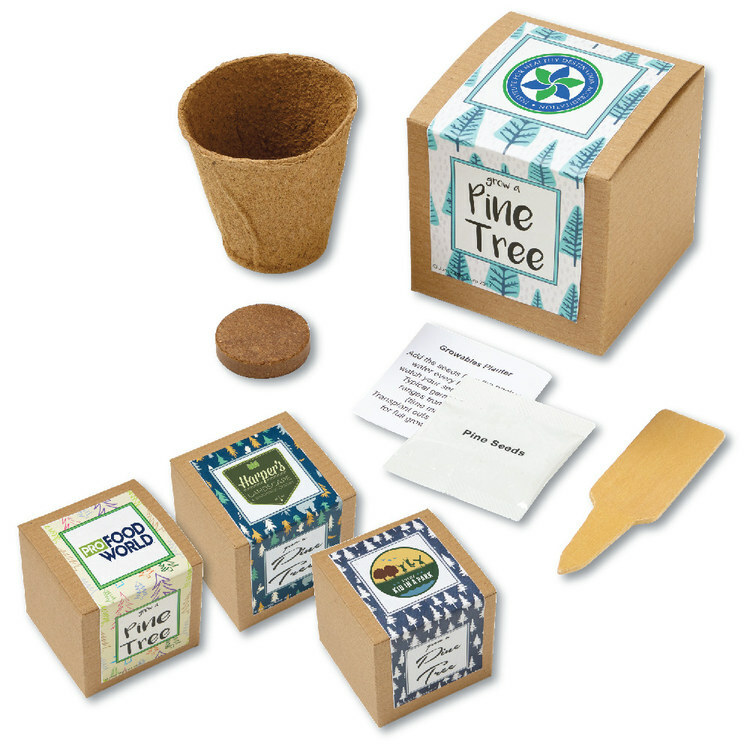 Each kit includes three packages of seeds, starter soil and three blank wooden plant ID stakes that you can write on. Use a stock design belly band or create your own-included in price. Choose 3 stock seeds: cumin, oregano, parsley, sweet basil, mint, thyme, cinnamon basil, lavender, cilantro, jalaBallpoint Peno, cayenne long thin, serrano tampiqueno, dwarf sunflower, impatiens, poppies, chamomile, lavender, and more. Give the gift of adoration, loyalty and longevity with sunflowers! Our fertile fiber pot is 100% organic, sustainable and biodegradable (made from spruce wood, manufactured without glue or binders) and ready to place outside in soil. Because water, air and roots will penetrate the walls of the fertile pot, there is no need for drainage holes - the natural root structure that develops helps in plant growth. Includes one soil pod and a sunflower seed packet. OMRI listed and USDA Bio preferred. Germinates in 2-3 weeks (results may vary). Simply place the soil pod at the bottom of the pot, add the sunflower seeds from the packet, water every few days. Typical germination time ranges from 2-3 weeks (time may vary). Once established, transplant outside in fertile soil. Each fertile pot is packaged in a 3"sq. recycled Kraft gift box and includes one soil pod, one seed packet, one wooden stake and instructions. Gift the gift of pine! 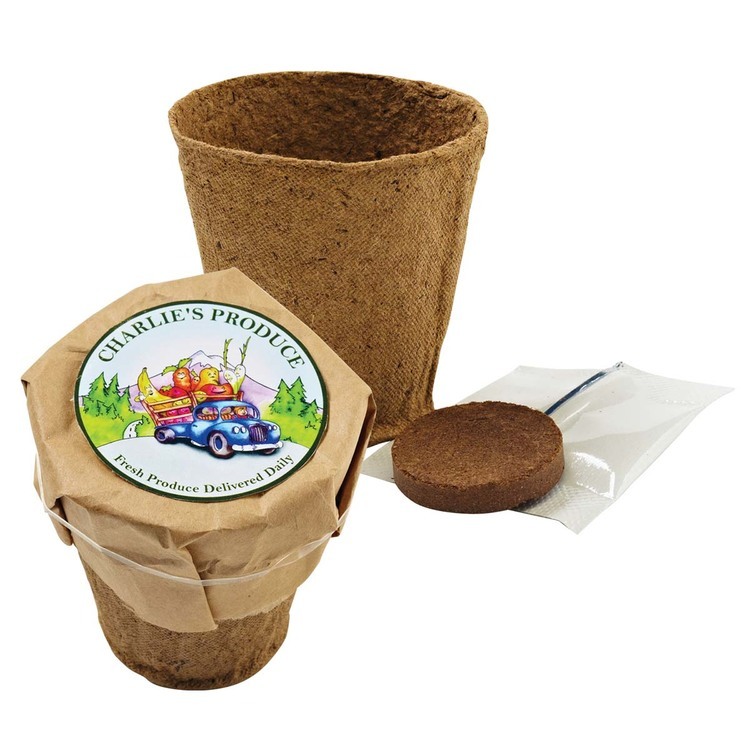 Our fertile fiber pot is 100% organic, sustainable and biodegradable (made from spruce wood, manufactured without glue or binders) and ready to place outside in soil. Because water, air and roots will penetrate the walls of the fertile pot, there is no need for drainage holes - the natural root structure that develops helps in plant growth. Includes one soil pod and a pine tree seed packet. OMRI listed and USDA Bio preferred. Germinates in 2-3 weeks (results may vary). Simply place the soil pod at the bottom of the pot, add the pine tree seeds from the packet, water every few days. Typical germination time ranges from 2-3 weeks (time may vary). Once established, transplant outside in fertile soil. Each fertile pot is packaged in a 3"sq. recycled kraft gift box and includes one soil pod, one seed packet, one wooden stake and instructions. Specify one of the 4 stock label designs you'd like (as numbered in the images shown), when ordering. 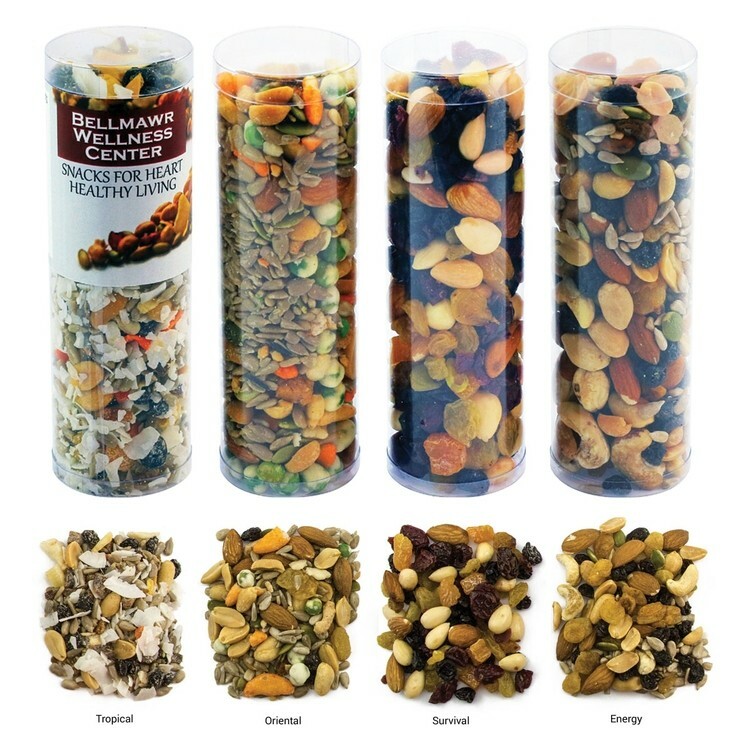 Filled with a variety of nuts, seeds, dried tropical fruit, peas, rice crackers, or raisins these tubes are printed with a laminated four color printed decal wrapped around the top. 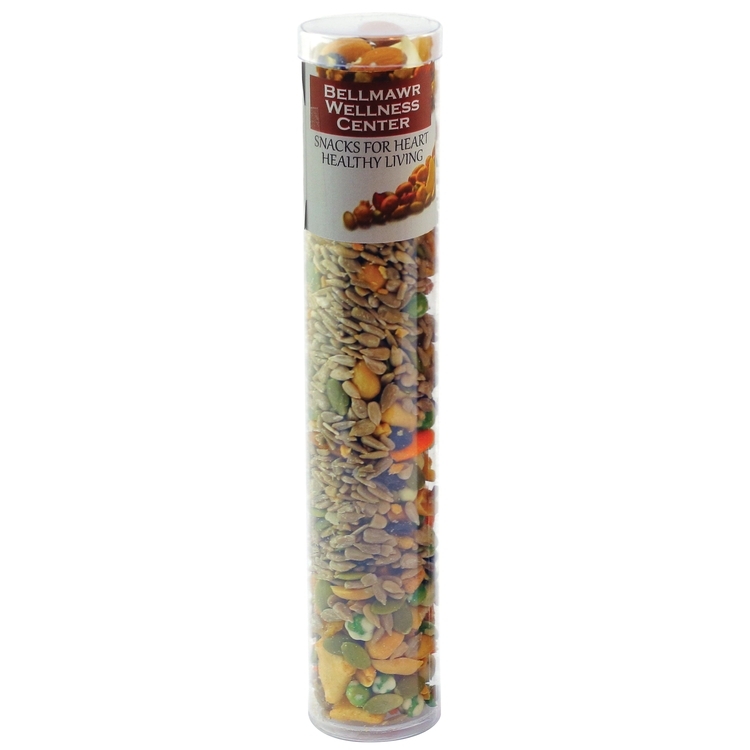 This tube can be filled with a variety of other snack mix treats. Healthy never looked so good! Our snack blends are bursting with flavor and nutrients and they're packaged in convenient take-along tubes. Default pricing is for tropical snack mix. Please see product options for other fill pricing. Some like it medium – give the gift of our cayenne peppers! Our fertile fiber pot is 100% organic, sustainable and biodegradable (made from spruce wood, manufactured without glue or binders) and ready to place outside in soil. Because water, air and roots will penetrate the walls of the fertile pot, there is no need for drainage holes - the natural root structure that develops helps in plant growth. Includes one soil pod and a cayenne pepper seed packet. OMRI listed and USDA Bio preferred. Germinates in 2-3 weeks (results may vary). Simply place the soil pod at the bottom of the pot, add the pepper seeds from the packet, water every few days. Typical germination time ranges from 2-3 weeks (time may vary). Once established, transplant outside in fertile soil. Each fertile pot is packaged in a 3"sq. recycled Kraft gift box and includes one soil pod, one seed packet, one wooden stake and instructions. Item Size: Box - 3"sq, Fertile Pot - 2-1/4"h x 2-1/2" top dia. 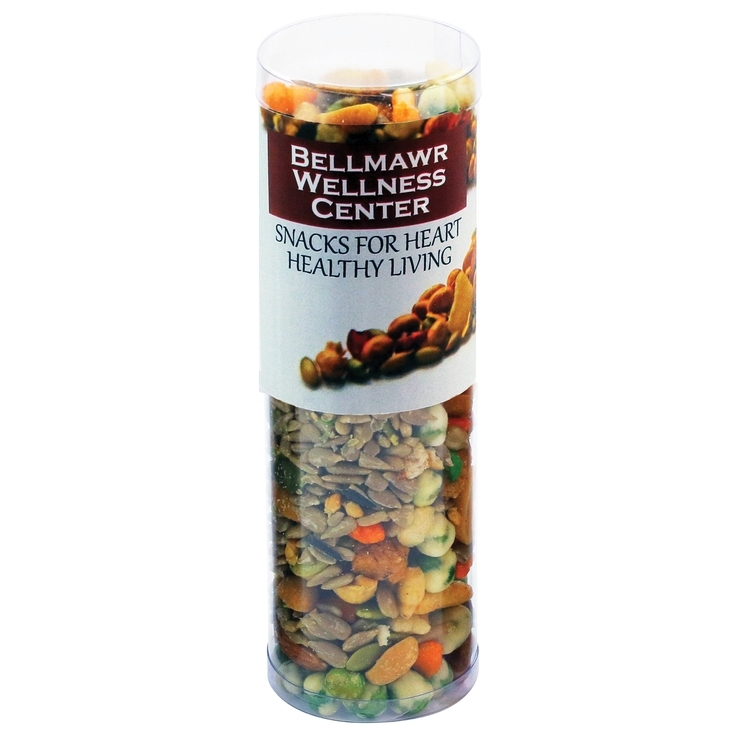 Filled with nuts, seeds, and dried tropical fruit these large tubes are printed with a laminated four color printed decal wrapped around the top. 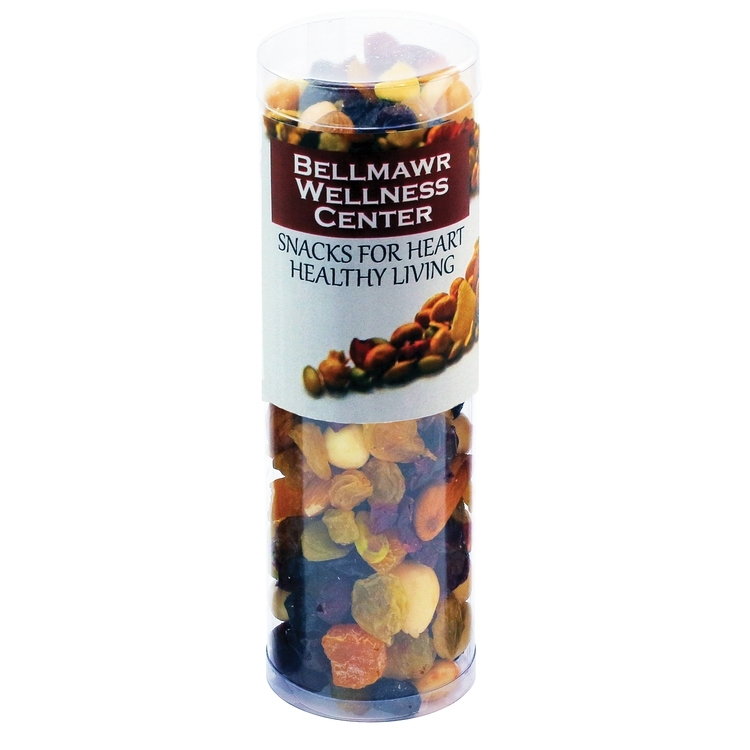 This tube can be filled with a variety of other healthy snack mix treats. Healthy never looked so good! Our snack blends are bursting with flavor and nutrients and they're packaged in convenient take-along tubes. Please see product options for fill pricing. These six tubes are filled with healthy snacks including a survival, orients, and energy mix. The snack mix can contain nuts, tropical dried fruit, seeds, wasabi peas, rice crackers, raisins, chex mix, pretzels The 4 color process insert provides a nice way to show your appreciation. This tube can be filled with a variety of other chocolate treats. Great corporate food gift for the holidays or Christmas. 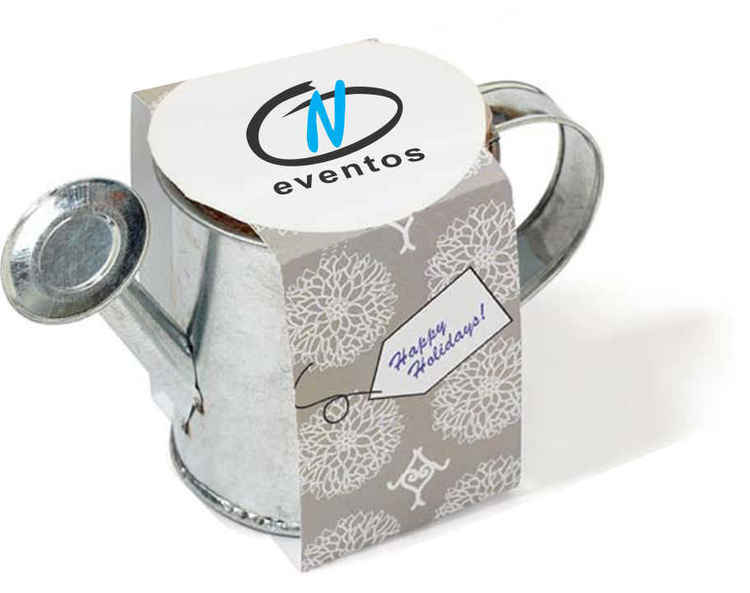 Our charming tall metal watering can come complete with a holiday wrapper and your choice of sunflower, forget-me-not or clover seeds- please specify seed type when ordering! Simply remove the seeds from the packet, plant under a light layer of good soil, water daily and maintain moisture until seedlings begin to sprout; typical germination time ranges from 1-3 weeks (instructions included). A random seed assortment will be used, if one type isn't specified.